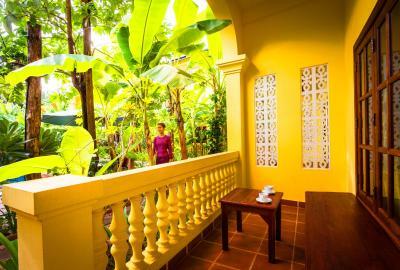 Lock in a great price for Le Jardin d'Angkor Hotel & Resort – rated 9.1 by recent guests! Lovely bathrooms and general staff were really helpful. The night manager is great and very helpful,he arranged tours which were fantastic. Our stay in this hotel was great. Staff is very forthcoming and polite. Pool is absolutely amazing. Room was really clean and comfortable. The lemon grass smell in the room was amazing detail. Wonderful staff, spacious room and bathroom and excellent pool area. Lots of loungers around the pool to enjoy the garden and pool area. Restaurant served reasonable priced food and the free shuttle was very handy. The quietness, cleanliness and the swimming pool. The food was also very good! This was our second time visiting this beautiful boutique. 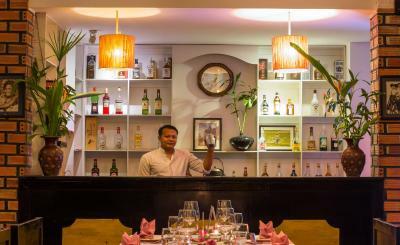 It’s definitely one of Siem Reap’s gems. The rooms are great and the pool is arguably the best in the city. Absolutely amazing value! A very well managed hotel with knowledgeable and courteous staff. Free shuttle into the center, spotless rooms, generous breakfast and lovely pool - couldn’t ask for more in this price range. Good breakfast,free one way transport to the city. Le Jardin d'Angkor Hotel & Resort This rating is a reflection of how the property compares to the industry standard when it comes to price, facilities and services available. It's based on a self-evaluation by the property. Use this rating to help choose your stay! Featuring free WiFi, a swimming pool and on-site restaurant, Le Jardin d'Angkor Hotel & Resort offers accommodations in Siem Reap. The vibrant Pub Street is 1.1 mi from the property. A 24-hour front desk is available. Angkor Wat is 5 mi from Le Jardin d'Angkor Hotel & Resort, while Angkor Night Market is 1.1 mi from the property. Siem Reap - Angkor International Airport is 3.7 mi away. The property offers complimentary airport pickups and shuttle services to the city center from 08:00 - 22:00 hrs. via electric car. Each air-conditioned room includes a flat-screen TV, safety deposit box and working desk . There is also a seating area for your convenience. All rooms feature views of either the pool or garden. Every room has a private bathroom with shower facilities, bath robes, slippers and free toiletries. Balconies are also available for you to unwind in after a long day. Guests can approach the 24-hour front desk for currency exchange, tour arrangements, ticketing and concierge services. The hotel also offers bicycle rentals for guests who wish to explore the surrounding area. 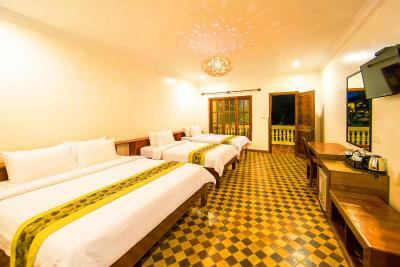 This property is also rated for the best value in Siem Reap! Guests are getting more for their money when compared to other properties in this city. When would you like to stay at Le Jardin d'Angkor Hotel & Resort? 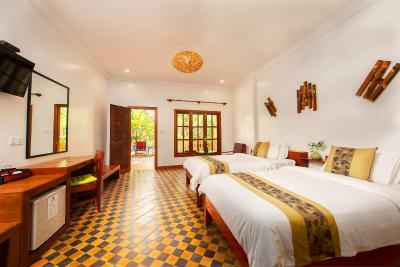 Located on the ground floor, these rooms offer Cambodian art décor style furnishing and direct access to the swimming pool. This triple room has a balcony, mini-bar and tile/marble floor. This family room features a balcony, private entrance and bathrobe. This twin/double room has a balcony, private entrance and mini-bar. This double room features a balcony, private entrance and patio. This twin room has a balcony, air conditioning and mini-bar. This family room features a tile/marble floor, sofa and bathrobe. 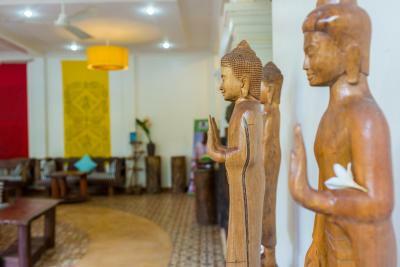 House Rules Le Jardin d'Angkor Hotel & Resort takes special requests – add in the next step! Le Jardin d&#39;Angkor Hotel &amp; Resort accepts these cards and reserves the right to temporarily hold an amount prior to arrival. Le Jardin d'Angkor Hotel & Resort accepts these cards and reserves the right to temporarily hold an amount prior to arrival. Please note that the property offers complimentary airport pick-up services Guests are required to provide arrival details in advance using the Special Requests box available. Please note that the property offers complimentary airport pick-up and shuttle services to the city center daily from 08:00 - 22:00 hrs. via electric car. Please inform Le Jardin d'Angkor Hotel & Resort of your expected arrival time in advance. You can use the Special Requests box when booking, or contact the property directly using the contact details in your confirmation. The food is ok but there is much better to be had in pub street. This is a beautiful hidden jem - the pool is beautiful and so are the rooms. The staff are kind and friendly and helpful. 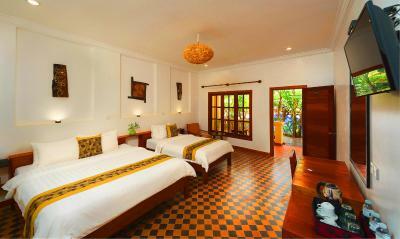 It’s a great location with easy access to the temples and pub street. The free transportation into pub street is a great help. Overall the staff were very polite, but it appears that nearly all of them were really not sure of themselves when responding to questions about the hotel or the city and some information on getting around. It seems to me that they require a lot more training. English language proficiency also appears to be a problem. There were no bedside lights. This made reading in bed a little difficult. The Hotel provides value for money. We were present in the hotel during the all important New Year season and although it appeared that the hotel was not fully staffed, the overall service was satisfactory. We had some of our meals in the hotel. The meals were reasonable. The staff also made sure to meet our needs for early breakfasts at 6.00 am or provide packed breakfast when we had early outings. Very spacious rooms and bathrooms with efficient AC and hot water supply. The hotel's restaurant is close to non-existing... Staffs are not properly trained. For instance, one day I asked for a coffee and been told didn't know how to do... Instead, I've been advised to buy a soda :( Also, except the eggs, the breakfast is barely acceptable... As an example, fruits are amazing in Cambodia and grow everywhere naturally. Then, how is it possible that the fruits offered at breakfast are barely fresh and/or tasty ? The location of the hotel is decently close to city center. Overall good value for money and swimming pool is great. Far from center and not easy to walk at night because of dark area and we had to get taxi, old and non sealed windows, room had leaks let insects and lizards come inside our room. Low options for breakfast. Staff english skill is poor. Very green yard and beautiful flowers, free shuttle car to city center, quiet place. The price is very good. Lovely quiet location outside of the city. Beautiful gardens and pool. Problems with plumbing and electricity in rooms. Hotel a long way from town. Tired decor in restaurant and poor food served. Lovely pool and garden. Problems with services resolved quickly when brought to attention of staff. Very large room, beautifulf garden and pool, helpful staff, 5-10 minutes by tuktuks to get to the city center (free ride offered by the hotel, $3 to come back). Had some issues with double payment (via booking and I was also requested to pay when we checked out) but it was refunded. Friendly and super helpful staff. Organised a lovely driver for several days of sightseeing. Food was very good, the best fish amok in Cambodia! 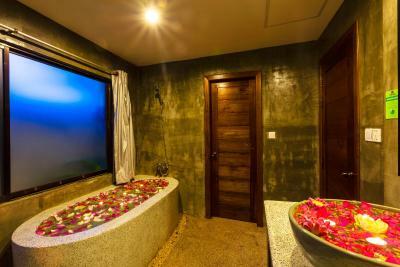 Beautiful pool, large and well equipped rooms with enormous bath tub and a tropical shower. A great hotel with lots of personal touches. Bathroom old. Surroundings - nothing within walking distance. Hotel rather remote. We really enjoyed our stay here - the rooms were spacious, clean and comfortable; pool great (and they have happy hour poolside); and the buffet breakfast was excellent. Staff were amazing, very friendly and helpful. It was nice being away from the busy town centre. We made use of the airport transfer pick up; and we got the hotel shuttle service into Siem Reap. Make sure you take the business card with you, as not all tuk-tuk drivers knew the address. The bathroom and the second day separate shower. The quite setting of the hotel, the garden. We had two rooms booked, for my husband and myself, and the 2nd room for our 3 young adult kids. The rooms were far apart. The wifi worked fine in our room, but not at all in the kids' room, and the staff claimed they were "working on it". The hotel advertises a shuttle service from the airport. I booked this service well in advance, through What's App with the manager, with a morning arrival time for part of our group, and an afternoon arrival time for my eldest son. We were assured this would happen. I sent another reminder message the morning of our arrival, and got an answer that it was too late to arrange it! I was told that my son would get a pick up in the afternoon, and that only one pick-up was possible per booking. But this was not the story at the time of the booking. My son was picked up in the afternoon from the airport by a hotel tuktuk, not by car. I tried many times to find the hotel manager to discuss this but he was never at the hotel. Because of this I wouldn't likely stay in this hotel again, as beautiful as it was. The pool area was beautiful, tropical, and formed the center around which you walked to get to your room. There were always staff around in the restaurant, reception, etc. The bathrooms were very cool, and really interestingly designed, with huge bathtubs. Beds very comfortable. Nice balconies. There was usually a hotel tuktuk to be found to get us into town. Aesthetically a very pleasing hotel. Excellent hotel in a wonderful garden with a very nice pool. Very good breakfast and most friendly staff. As the city center is not in walking distance the hotel friendly offers a free transfer service to the city center. Free transfer from the Bus station is also possible.